THE CHINESE WALK SOFTLY, SPEAK LITTLE, BUT...ACT SWIFTLY. Even China experiences Muslims and Islamic Terrorists but, unlike America, France, England, and other countries...Chinese Leaders control their country----not the other-way-around. Many disagree with China's method of control BUT....few challenge it. 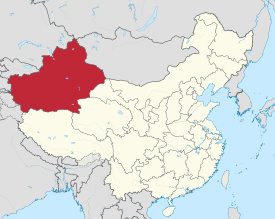 Xinjiang (Shen-Jong) Province is China's notorious renegade province. It’s home to Chinese Muslims and lies along the Northwestern border between China and Turkey. When the Muslim residents of Xinjiang get overly-confident and venture into other provinces to bomb buses, steal, murder, create unrest and violence....the Chinese Government simply instruct the military to line up the suspects…. and their families....and shoot them. That solves the problem for a few years until----the International Muslim Brotherhood pays more recruits to stir-up trouble and the process begins all-over again. For years, the Chinese Government has threatened to build a wall around Xinjiang and imprison every Muslim inside the renegade province. Knowing the Chinese as I do....they will eventually tire of the Muslim Drama, say “end-it”, and kill every Muslim in China. Chinese Leaders don’t get mad----they get enough.